This blues-focused article was in need of a few tweaks, so we removed several older models to freshen things up. In their place we added four new models, comprising the excellent Fender Eric Clapton Stratocaster and Godin 5th Avenue CW (Kingpin II), as well as two nice blues acoustics in the Gretsch G9500 Jim Dandy Flat Top and LH-204 Brownstone from The Loar. What’s that soulful sound? That’s the sound of the blues! What makes a blues guitar? That’s not such an easy question to answer. In fact, blues guitar is one of the most dynamic music styles with so many sub-genres – jump blues, blues rock, boogie-woogie, Delta blues… the list goes on. What Makes A Good Blues Guitar? This means defining ‘the best guitar for blues’ is a difficult one indeed. Some players want electric, some want acoustic. Some want solid bodies, some want hollow. Some want resonators for slide, some want them for fingerstyle. However, as we’ve shown in our chart below, there are certainly some models which are incredibly well-suited for blues playing. Check out our selections – a mix of electric, acoustic and resonators – for a little inspiration. 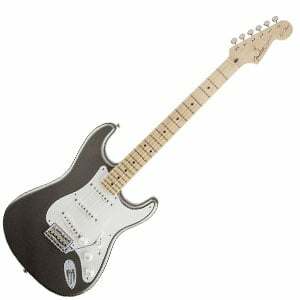 A versatile blues Strat developed specifically for Slowhand. High-end remake of the original Starfire V from Guild. Driven by the standard three single-coil pickups. Strong contestant for the title - the best blues guitar. Beautiful bluesy archtop that’s made in Canada. Delivering that bright, twangy vibe. Simple but authentic-sounding pre-war blues acoustic. A boxy little parlor that’s great for vintage blues. An acoustic sound with extra grind and bite to it. As we’ve mentioned, there’s no one-size-fits-all blues guitar. But good blues guitars will share some characteristics. With hollow and solid-bodied blues guitars, power and articulation is important, although you don’t want something too extreme – nobody is playing great blues on a modern shredder with searing-hot active pickups. Generally, something with a vintage feel in both look and tone will give you a good blues sound. As for acoustic guitars, blues will always sound better on something with a bit of warmth, preferably on the twangy side. Look for models featuring mahogany or cedar and preferably with a solid top, which will open up with warmth as it ages. Any good-quality resonator can be a good choice too, especially if you’re looking at playing with a slide. Needless to say, we always want our instruments to be durable, reliable and the best value for money we can find. If you have the budget for an expensive guitar then go for it! But, as we’re about to see, you can also find some brilliant blues tones on a guitar that costs well under $500. There are few guitarists more iconic in the world of blues than Eric Clapton and this American-made signature Stratocaster from Fender encapsulates everything great about a blues guitar. With several simple color choices, this model features a minimalist style that takes a back seat to the playability and tone. The body is made from solid alder, while there is a satin-finished maple neck with Clapton’s favored soft V shape. In terms of hardware, this axe is loaded with a trio of Fender Vintage Noiseless single-coils, with a host of complex tone controls. The result? An awesome blues sound that is a joy to show off with. There’s more in the full review of the Eric Clapton Stratocaster. Readers of our articles on the best blues guitars will already be familiar with the high-end Starfire V from Guild – a beautiful Korean-made reissue of the original 1960’s Starfire V.
With a semi-hollow body made from laminated maple and one of three gorgeous retro finishes to choose from, this reissue shows off plenty of vintage appeal, premium build and comfortable playability on the three-piece soft U-shaped neck. Thanks to the pair of unique ‘Little Buckers’ and the quality electronics, this guitar sounds as good as it looks, with a versatile tone offering warmth and balance that’s perfect for everything from jazz and blues to classic rock. You can read more on the Guild Starfire V in the complete review. We’ll kick things off with an undeniable classic for all ages – the one and only Fender Stratocaster, the American Special model. Driven by the standard combination of three single-coil pickups, this puppy was crafted right in the US of A, featuring an alder body, a maple neck with a 9.5-inch radius maple fingerboard, a pack of 22 jumbo frets, and black dot markers. The pickups in question are the Texas Specials, while the rest of the mix also includes a vintage-style tremolo and a satin urethane finish. The sound is of course classic Strat, the mellow yet punchy, well-rounded sound that helped defined the sonic attack of classic rock and blues. One of the best guitars for 1000 dollars and a shoo-in for more lists than this blues-driven rundown, that’s for sure. If you like your audio output to be loaded with a bit more of a modern edge, but still deeply rooted in tradition, our strong contestant for the title of the best blues guitar is the PRS Custom 22. This fella utilizes a mahogany body and a mahogany neck, reeling in an organic sonic attack with plenty of natural boom and resonance. The six-string also features a rosewood fingerboard, a pack of 22 frets, 25-inch scale length, and of course the company’s signature flying bird inlays. The sound offered by this beast is quite powerful, but also fully under the player’s control, which is crucial for the slightly more mellow blues and jazz style. Needless to say, if you want this puppy and its two PRS pickups to roar in rock and even metal manner, it can easily be done with merely a few knob twists and switch adjustments. They say that a Telecaster is one great guitar for the blues, but they also say that semi-hollow guitars do a fine job for this style. So, why not both? Our next contestant comes from Fender subsidiary Squier and it’s called the Classic Vibe Thinline Telecaster. We’re looking at a light semi-hollow body crafted from mahogany, along with a single piece maple neck, a set of 21 medium jumbo frets, a maple fingerboard and black dot markers. The combination of two classic bright Tele pickups, the booming nature of mahogany and extra resonance of the semi-hollow body reels in an interesting sonic mixture that’s very well suited for the blues style. The looks are pure class, there are three available finishes – Vintage Blonde, Butterscotch Blonde, Natural, and 3-Color Sunburst – but we have to say that in our opinion, Natural takes the cake. A great mixture of classic Tele and solid-body guitars for blues! With the 5th Avenue CW, the popular Canadian brand Godin deliver a wonderful North American-made archtop guitar that will suit blues players as much as it does jazz. Sporting a comfortable retro single-cutaway body, it features a quality build using Canadian wild cherry for the top, back and sides (with three attractive finishes to choose from), and a silver leaf maple neck. Detailing such as the tortoiseshell floating pickguard and f-holes add to the overall vintage appeal. As we discuss further in the complete breakdown of the Godin 5th Avenue CW, this impressive archtop sports two solid Godin-designed P90 Kingpin single-coils that deliver warm cleans and a good dose of grit for blues playing. 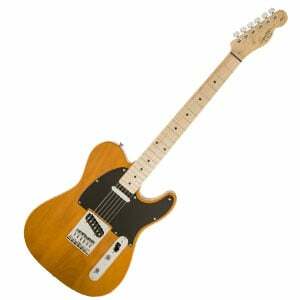 Finally, arguably the best cheap electric blues guitar – the Affinity Telecaster from Squier. 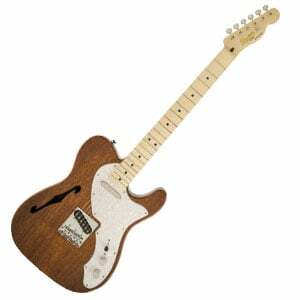 We already noted that a Tele is a good choice for this type of music and we believe that this one fits the bill the most. 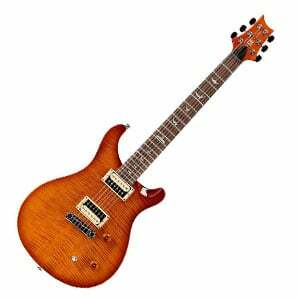 The first reason is the fact that even at this cheap price, the manufacturer managed to throw in an alder body, which is a feature associated with far more expensive instruments. Secondly, the pair of single-coil pickups really does a fine job in delivering that bright, twangy vibe that just screams blues rock. There’s enough room for various sonic modifications here through Volume and Tone knobs, and the onboard pickup selector. For the listed price, this is really a stellar deal! The high-end Chinese guitar brand The Loar craft exceptional acoustic models, with their LH-204 Browstone proving a solid choice for blues guitarists, for both its style and sound. We discuss the design more in the full review of the LH-204 Brownstone, but first impressions are that it’s a well-made, yet simple guitar, with a small pre-war body style made from a brown-stained solid spruce top, with mahogany back and sides. The 19-fret C-shaped mahogany neck is comfortable to play, while the hardware is commendable at this price. While it’s not the loudest guitar out there, the tone is fantastic for blues, with a warm and mellow sound that remains tight and nicely balanced. There’s a reason the G9500 Jim Dandy Flat Top appears in so many of our charts – it has a lot to offer guitarists of all abilities and styles. 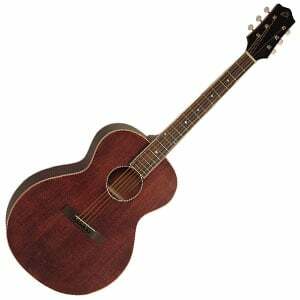 With a classic parlor build and retro design, it’s a great little acoustic for blues. It features a compact 24” scale length body, which is made entirely from laminated agathis and shows off a couple of vintage color choices. Attached is a playable C-shaped solid nato neck. With the small size, the projection is a little quiet, but the tone is sweet and boxy, making vintage fingerstyle blues sound authentic. As always, you can read more on the G9500 Jim Dandy Flat Top in the main review. Another sound that defines a certain style of blues comes from the mighty resonator guitars. These things combine wood and metal to reel in an acoustic sound with extra grind and bite to it. 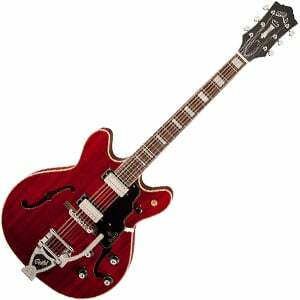 The specific model we have in mind is the G9200 Boxcar from Gretsch. This fella is highly resonant thanks to a full-on mahogany body combined with a sturdy mahogany neck. This tonewood combo secures a booming sound with plenty of power, bite, and punch, but also a mellow side that works like a charm with light blues and slide guitar. Additional notable features include an AmpliSonic cone, a spider bridge, a rosewood fingerboard and a 25-inch scale length. This brings us to the end of our little blues journey, but for you it’ll only be the beginning! We hope you’ve enjoyed the read and taken a little inspiration when looking for a great blues guitar to accompany you as you embark on this exciting genre. If you are at the other end of the spectrum and prefer heavy rock and metal… then what are you doing on this page anyway?! Go check out our article on the best electric guitars for metal. Be sure to subscribe to our newsletter and, if you have any questions, drop a comment in the section below. Good luck with the hunt for your ideal blues partner! I have went through a few guitars searching for that blues sound I want… PRS Clone through the traditional es 335. But my choice is the Gibson Nighthawk… it’s 3 pick ups and controls offer a range of tonal selections that makes blues sound deep and colorful. I had the BluesHawk too.. and found it less of a blues axe than than the NightHawk. I wish the NightHawk was still being produced… it could benefit from advanced circuitry and pick up quality. In my “stable” of guitars, the NightHawk beats the others in tonal versatility.